When we first started thinking about selecting an engine I thought that would be fairly easy; look into the various manufacturers, drill down into the product line each has and then pick the one you want. Well, not so easy. 6BT Reman; A remanufactured 6BT that will essentially be a 210HP engine that has been remanufactured. New QSB; The Cummins line today is the QSB which has a common rail fuel line, electronically controlled fuel flow and a belt driven water pump. I had my heart set on a new engine, so that left the QSB. The QSB line offers a wide range of horse power but for our application it basically comes down to the 230 or the 305, theres nothing in between. There is absolutely, positively no difference between the 230 and the 305; it's all in the software the engine has to regulate everything. The difference in price is $3,000.00. So, we went with the 305, despite knowing its on the large size for this boat. I would have loved something around 250, 260 in there but you don't have that choice. So, long story below, short story here; if you want a new Cummins your only choices are the QSB 230, or the QSB 305, or the QSB5.9 as cummins calls it. In reality, at least around these parts, you really have three basic choices on the manufacturers; Yanmar, Cummins and Caterpillar. When we started investigating this I was not familiar with the Cat line, and did not know of many people who had one. That, by default, left me thinking about a Yanmar or a Cummins. 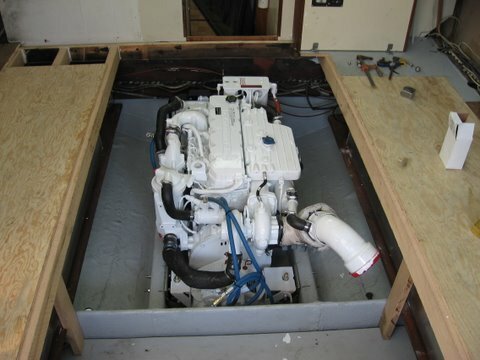 We began looking into both, but more so the Cummins due to the fact that two people involved in the Mainship Group had repowered their boats with a Cummins. Furthermore both were kind enough to post detailed information on their experiences. Dave Fuller has an excellent web site that has pictures and great info. And the famous Jay Leonard gives a detailed account complete with cost break down and advice. So with that information I at least felt I had a good road map. 260 HP 6LPA-DTP which has a dry weight, without gear of 837 lbs and a WOT of 3,800 RPM’s. 315 HP 6LPA-DTP which has a dry weight, without gear of 899 lbs and a WOT of 3,800 RPM’s. The only real price I got on the Yanmar was $23,000 for the 315 HP model at the 2007 Providence, RI boat show. As noted above I spent more time drilling into the Cummins because of the information I had from two other people putting a Cummins in. This was good and bad. The good was it kept me down the Cummins road which I do feel is the better engine for my particular application. The bad is the previous guys put in 6BT’s which turned out to be very different than the QSB, and low and behold they don’t make the 6BT anymore. Compounding this is the fact that the QSB is way bigger than the older 6BT. The product line for my application is the Cummins QSB This product line goes from 230 HP up to 480 HP and interesting enough the entire product line is essentially the very same motor. There is some difference in the coolers as you get larger, but essentially the difference is in the software used to regulate the fuel flow. The engine we initially focused on was the QSB 230 HP which has a dry weight of 1,250 lbs and a WOT of 2,685 RPM’s. What’s important to note about the QSB is that the fuel is electronically monitored as opposed to mechanical. This is a very big jump in diesel engine technology and results in much cleaner operation from exhaust smoke to un burnt fuel ending up in the exhaust. I will say after years of operating the Perkins, cleaner sounded better to me. The Perkins in my un technical opinion was the most environmentally unfriendly motor I ever saw. Don’t get me wrong I was quite fond of the blue monster but the smoke on start up was awful and no matter how much we tinkered at idle it would leave a sheen that I did not like. The Cummins weighed more, ran at lower RPM’s and had much newer fuel monitoring technology. So, to make a bit of a real long story short, we started to really hone in on the Cummins 230 HP. Alas, not so fast. Not too far into this we discover, as noted above, that the 230 and the 300 are, in fact, the exact same motor. There is literally no difference in weight or in WOT RPM’s. The difference comes from the software the engine has. You could in theory, buy the 230 and upgrade to the 300 at a later date. So the question becomes what’s the difference in price? $3,000 to go from 230 HP to 300 HP. This really threw wrench into the decision as I never imagined putting in an engine with that much power. Then the folks at Cummins ran the numbers for us and there was not a great gain in wide open speed (which I didn’t really care about because frankly I don’t think the hull can go as fast as the engine could push it, but in cruising speed.) The 300 could push the boat, at a cruising speed of 15 knots continuously. Do I really need 15 knots cruising speed? Not really but I thought from a re-sale standpoint that extra couple of knots could really help. One thing a lot of people will just never accept about a trawler is the speed. Ok, so now were ready to commit to the Cummins QSB 300; well we hit one more snag. I downloaded off the internet, and the folks at Cummins sent me, drawings of the QSB, but I didn’t really read them in great detail because I MISTAKENLY just assumed the dimensions of the engine would be similar to the 6BT. Well low and behold the QSB is much bigger. I realized this when I went to the 2007 Providence, RI boat show and the salesman I had been dealing with, Mel Mogard, was there with a shiny new QSB. I took one look at it and just could not believe the size of it; wider, and taller by a lot. So now, the question of will it fit. I went back and spent a great deal of time reviewing the drawings but there’s just something about those mechanical drawings that just make my eyes cross. I made up a quick mock up of the size of the engine in the engine bay and did not like what I saw. I began to have thoughts of the Yanmar, which is much smaller than the Cummins. I was really torn. As luck would have it a friend of mine, Tom Drew, actually had a brand new Cummins QSB 380 in his garage. (this is a true tale, I promised no lies here). He is building a boat from scratch basically and bought the Cummins a while ago. Over a few beers one day he’s says come on by and take some measurements. So I go over his house and there it is sitting on a giant pallet pretty as can be. I took a piece of super thin ply wood and placed it on top of the engine and literally traced the foot print. Then I cut that out and placed it in the engine bay at the appropriate height. Once I did that it didn’t look as bad. I made the decision to move forward with the QSB, and am going to make some engine hatch adjustments to get me more room. So it’s the Cummins QSB 300. This is my friends QSB 380, all ready to go! Looks pretty sweet. Next up I needed to get a feel for the angle of the shaft, and how that would translate to the height of the engine. Whats really critical about this is choosing a gear. There are different gears for different sized engines and as were going with the Cummins 305 the two choices are a straight gear and 10 degrees down. The shaft has an angle of about 5 or 6 degrees. The old Perkins bascially was a straight line, the gear, a Borg Warner Velvet Drive was essentially a straight extension of the engine. The entire thing then sat at an angle on the engine mounts to accomodate the angle of the shaft. I wanted to be able to "extend" the shaft, which would essentially represent the line of the crank shaft, from that I could measure the overall height of the motor in the boat. This is to understand if putting a straight gear on the new engine is feasible or not. So, the best way I could figure was to tape a slim board onto the shaft. The angle is more than what really I want. It's forcing the front of the engine up, which is of concern. However, I don't think I will have any choice because the only other option is a 10 degree down angle gear, and that would force the nose of the engine down at least 4 degrees, which is unnaceptable to Cummins. Because I am going with the 300, I need to move up in gear size. If I went with the 230 I could use a gear with an 8 degree downangle, which would put the nose down by 2 degrees which is acceptable to Cummins. So after all this, the engine we will install will be the Cummins QSB 5.9, with a ZF 220 1.5 gear.